WASHINGTON — Seattle police, considered by some to use force too fast and too often, reached an agreement with the federal government that gave all officers training on how to better handle people suffering from mental illness and substance abuse. Residents’ attitudes toward police improved. New Orleans police, plagued by decades of corruption and abuse, came to a similar court-enforced agreement with the Justice Department that led to improvements in sexual assault investigations and changes to department policy. But the 2012 consent decree is expected to cost at least $55 million, and critics say it requires rank-and-file officers to complete time-consuming paperwork when they could be patrolling. As new Attorney General Jeff Sessions signals his Justice Department may back out of such federal agreements with troubled police departments, a look at some of them shows they can be popular but also carry mixed results. “There’s no question that some of these consent decrees are arduous and complicated, but they will (force cities to) provide the kind of resources the department very often needs,” said Chuck Wexler, executive director of the Police Executive Research Forum, whose study of consent decrees found them costly but useful in helping departments deal with broad issues. The Obama Justice Department saw such probes as essential in holding local law enforcement accountable for unconstitutional practices such as excessive force and racial bias. It opened roughly two dozen investigations of police departments, 14 of which ended in consent decrees. But Sessions has a different view, expressing concern that the scrutiny can malign entire agencies and harm officer morale, something his predecessors disputed. Sessions believes federal intervention has led in some circumstances to less aggressive policing and a spike in violence in some cities, particularly Chicago, where negotiations over a possible consent decree are now uncertain under his leadership. Cities involved in such agreements cite benefits as well as drawbacks. “Consent decrees take a major toll on local elected officials, police departments and stakeholders,” said John Gaskin III of the NAACP in Ferguson, Missouri, whose leaders entered into such an agreement after Michael Brown’s shooting death at the hands of police in 2014 roiled the St. Louis suburb. “They (consent orders) are not easy to put together. They’re time-consuming and, quite honestly, emotionally draining,” Gaskin said. “I hope we don’t turn back the clock with this decision” of Sessions to retreat from the agreements. Officials in Seattle say the results have been unequivocal. The Justice Department’s investigation, after an officer’s fatal shooting of a Native American woodcarver in 2010, found officers had been too quick to be physical, especially in low-intensity encounters. The 2012 settlement overhauled the department’s training, procedures and record-keeping. Since then, responding to roughly 10,000 calls a year in which people are in some type of behavioral crisis, officers used force just 2 percent of the time — and in the vast majority of those instances, they used the minimum level of force. Mayor Ed Murray said officer morale actually improved with increasing respect and understanding from the community. In New Orleans, the Justice Department opened a series of civil rights investigations focused on police misconduct in Hurricane Katrina’s aftermath. It also embarked on a separate push to address systemic problems in the police department. The latter effort led to the signing of the consent decree. Civil rights attorney Mary Howell said the court-mandated reforms have had an “enormous impact” on a police department plagued by decades of corruption and abuses. The police department in New Orleans has rewritten its policies governing officers’ use of force and is revamping its police academy, among other changes. A recent survey showed public satisfaction and confidence in the police have improved. The reforms haven’t been cheap for the city, and the federal government isn’t footing the bill. Rafael Goyeneche, president of the independent watchdog New Orleans Metropolitan Crime Commission, said a massive paper trail is necessary for the courts to determine if police departments are complying with a consent decree’s terms. And that paperwork flows down to the rank-and-file officers in the field, he said. “That becomes a more critical issue in a city like New Orleans, where there is a manpower crisis,” Goyeneche added. Officers realized the need for reforms, but would welcome a loosening of oversight and reviews that are redundant, said Mike Glasser, president of the Police Association of New Orleans. The bureaucracy involved can make officers think twice about making a traffic stop, he said, or approaching a suspicious person. In Detroit, the Justice Department targeted the police department’s use of excessive force and its treatment of crime suspects. A 2003 agreement to make improvements lasted under four mayors until the government found there was substantial compliance by 2014. A federal judge closed the case in 2016. “The results are compelling,” the Justice Department said in a 2014 court filing, pointing to declines in use-of-force and the end of arresting and detaining witnesses. The agreement cost Detroit more than $50 million, including $15 million for court-appointed monitoring teams. Craig said it would be less expensive to hire the right police chief rather than paying a monitor, which sometimes doesn’t sit well with police officers. “When morale goes down, there is no real service to the community,” Craig said. Contributing to this report were Associated Press writers Gene Johnson in Seattle, Kevin McGill and Rebecca Santana in New Orleans, Michael Kunzelman in Baton Rouge, Louisiana, Jim Suhr in Kansas City, Missouri, Ed White and Corey Williams in Detroit. 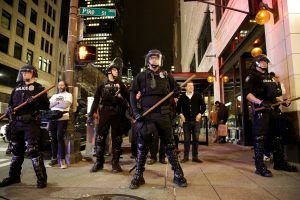 Left: Police stand watch as people march in protest of President Donald Trump's inauguration in Seattle, Washington. Officials in Seattle say they've had good results from their Justice Department review, seeing a significant reduction in use of force by officers responding to calls. Photo by REUTERS/Jason Redmond.